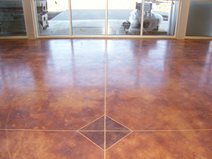 Stained concrete may look natural, but getting the right look can be a challenge. Here are six techniques contractors from around the U.S. are using to create decorative, colored floors and flatwork. 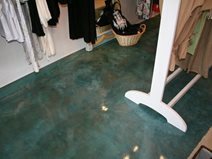 For this beach-themed store, Matt Hine of Progressive Concrete Coatings in Wilmington, NC sprayed turquoise acid stain. "To get the mottled look," he explains, "I spray a little heavier than normal, creating a wet layer of stain. You can't be afraid to have it puddle where the concrete is not completely flat. The stain will naturally puddle giving the floor a richer color in certain areas." Because of this technique, Hine was able to use just the turquoise acid stain to create a variety of color tones on this project. Read more. Glen Roman of Staintec in Rancho Cucamonga, Calif., used Newlook (Sierra solid color stain) for the base color on this retail floor. Then he used enhancers Spanish Clay, Buffalo Brown, and Terra Cotta. Roman's technique is to create random splatters with multiple colors of the enhancers then using water to blend and fade the colors together. "The client liked the wild color effect," he says. "The enhancers are antiquing, translucent fluid. When you use the enhancers on a smooth floor, it's like faux finishing," he says. Read more. 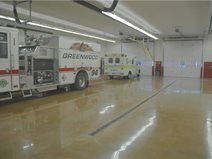 Kerry Calvert of Artistic Surfaces in Indianapolis used a new application procedure for acid staining in the engine room of a fire station. His technique essentially eliminated the etching effect that acid stains leave on most concrete surfaces, which can make a polished floor look dingy when viewed in highly reflective lighting. "We slightly diluted the acid stain, using a 1-to-3 ratio of water to acid stain, and sprayed the solution on the floor, immediately spreading it with a microfiber mop," says Calvert. 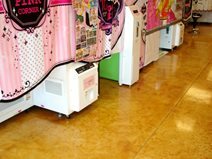 "Not letting the stain pool helps quite a bit in eliminating the severe burning and etching that can take away from the shine and clarity of a polished floor. It also takes away from the dramatic mottling effect that some people want to see. But in this case, the firemen wanted more of a flat, consistent color." Read more. 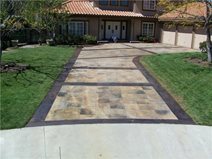 "I like to use a variety of color," explains Scott Cohen of The Green Scene in Northridge, Calif., "so on this driveway project, we used 3 or 4 varying shades of tans, browns, and charcoal acid stains." Using a combination of Brickform stains and Triple S stains, Cohen layered one coat after another of the multiple colors. "The trick is to drench the concrete in color, first using mist bottles at ½ rate cut with water, then full rate," he explains. "You want to cover the area with drops of one color, then layer the next color, etc. It's kind of like how they print newspapers with multiple drops of ink." Read more. On 4,700 square feet of floor, Shane Ober of Solid Rock Concrete Services in Gravette, AR, used Kemiko's 50/50 stain Brick Red with Amerpolish's Dye & Seal Caramel color. "Then we came back over the floor to do some highlighting and some veining with a deep caramel," he explains. He also used a 50/50 black Kemiko stain for parts of the floor design. "We applied the color with an HVLP sprayer, and brushed it back in so it looks really neat," says Ober. "To get the variegated look, we use construction paper on it to create a vein, then come back in and use the HVLP sprayer. Then we put down another color." Read more. 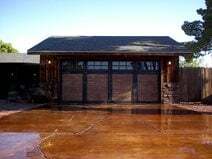 Rick Metzler of Pizzazz Painting in Las Vegas used Super-Krete's water-based stains for coloring this home's driveway. "It's a linear process with tri-color variation," he explains. To begin the process, he first wet the driveway. "Then I hit the cracks with a dark, walnut color and some black. This accentuates them and darkens them up," he says. Before it completely dries, he adds a random coat of the lightest color, which on this project was Super-Krete's yellow. "I covered the entire driveway randomly as a base with the yellow," he explains. "It blends with the dark colors in the cracks so the cracks don't become the focal point." Then he sprays another coat in between with the medium hue, terra cotta. The last coloring step is to spray full coverage with the walnut. "I'm able to get a nice variegated look this way. It looks very organic," he says. Read more.